Four-party alliance picks Bouteflika to run in April’s presidential poll but ailing leader yet to confirm he will run. Algeria’s ruling coalition named President Abdelaziz Bouteflika as its candidate for elections slated for April, although the ailing incumbent has yet to officially confirm he will run. “The parties of the presidential coalition nominate Abdelaziz Bouteflika for the upcoming presidential elections,” the four coalition partners said in a statement on Saturday. The meeting was attended by Mouad Bouchareb, speaker of the lower house of parliament and coordinator of Bouteflika’s National Liberation Front, as well as by Prime Minister Ahmed Ouyahia, head of the National Rally for Democracy. The leader of the Rally for Hope in Algeria party Amar Ghoul and Amara Benyounes, who heads the Popular Algerian Movement, also attended. 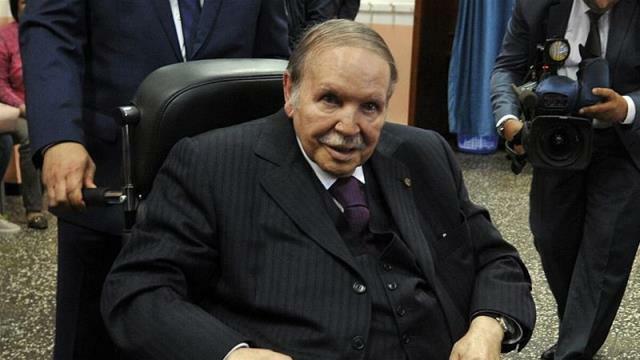 In power since 1999, Bouteflika, 81, uses a wheelchair and has rarely been seen in public since suffering a stroke in 2013. For the last presidential election in 2014, Bouteflika only declared his intention to run a few days ahead of the deadline. Prime Minister Ouyahia has said “there is no doubt” the president will seek a fifth term on April 18. Ouyahia said earlier this week that Bouteflika’s health was not “an obstacle” to performing his duties as president. Presidential candidates have until March 3 at midnight (23:00 GMT) to submit their applications. Algeria’s main Islamist party, the Movement for the Society of Peace, will also take part in the poll, backing its candidate Dr Abderrazak Makri. The country’s oldest opposition party, the Front of Socialist Forces, announced on January 25 that it would not field a candidate and called for an “active, intensive and peaceful boycott” of the ballot.